in South Korean President Moon Jae In’s presidential box at the closing ceremony of the Pyeongchang Olympics. Following a period of easing tensions in North-South Korean relations surrounding the Pyeongchang Winter Olympics, the possibility of the North sitting down for talks with the United States has increased. While the two countries are both making overtures towards dialogue, the potential outcome of any such talks remains unclear considering the disparate positions of the two sides over the North’s nuclear program. Following last week’s visit by North Korean Director of South Korean Affairs and Head of the United Front Department Kim Yong Chol to the closing ceremony of the Olympics, reports emerged that the North was ready for talks with the US. Kim reportedly said that the door was open to talks and that the North was carrying out preparations for dialogue. 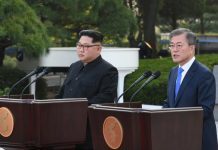 While it remains unclear whether Kim expressed any preconditions for such a meeting during his visit to the South, the move represents a significant development in the midst of the regime’s constant blaming of US policy – which has remained largely unchanged – for their inability to agree to talks. The speech hinted at a strategic shift towards economic revival following a ‘victory’ in achieving the regime’s nuclear aspirations. But the North may see engagement with the US as a necessary step towards easing the international sanctions that are weighing heavily on the North’s current economic problems. 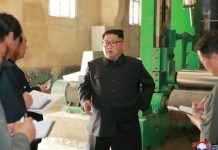 “The North Korean regime is feeling the heat from the increasingly precise sanctions measures, so if they want to focus on economic growth, they will have to find some way to achieve a breakthrough in getting sanctions lifted,” said Oh Gyeong Seop of the Korea Institute for National Unification (KINU). The North’s warming attitude towards South Korea and their participation in the Pyeongchang Olympics can be seen as a first step in this strategy towards lifting sanctions. The general view among analysts is that the North is leveraging relations with the South in order to eventually improve relations with the US. However, the North’s recent actions may be part of a broader strategy to stall for time to allow the country to complete its nuclear program – taking advantage of South Korean President Moon Jae In’s openness for his “Peaceful Olympics” plan. Oh added that while the international community remains most concerned with the North’s nuclear missile program and wartime deployment capabilities, the regime requires more time to complete these areas of development. “North Korea’s current strategy is to minimize the US military threat while it focuses on these goals,” Oh said. ceremony on February 9, along with Kim Jong Un’s younger sister Kim Yo Jong. Meanwhile, the US announced additional sanctions measures against the North on February 23, signaling a continuation of their ‘maximum pressure’ campaign. 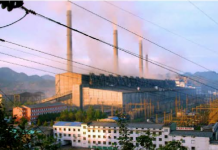 The Trump administration likely believes North Korea’s shift in attitude is a result of their unyielding policy towards the North and yet more evidence of the success of international sanctions which they have been aggressively pushing in recent years. During a meeting at the White House with state governors on February 26, Trump said that the US has been “very tough” with North Korea. “So they want to talk. First time – they want to talk. And we’ll see what happens. That’s my attitude: We’ll see what happens. But something has to be done,” he said, suggesting that the current policy is working. At the same time, it appears that the US is leaving open the possibility for talks. “They want to talk. And we want to talk also, only under the right conditions. Otherwise, we’re not talking,” Trump said during the meeting earlier this week. However, while no specific details have been provided as yet, mentioning a requirement for “the right conditions” indicates that the US will likely seek preconditions for talks.